It’s Monday morning, and I’m exhausted. I haven’t been sleeping well, though I can’t put my finger on why this might be the case. My allergies aren’t bothering me. My diet’s fine. I’m getting plenty of exercise. Regardless, I’ve been waking exhausted. I had hoped to get up at 4am today, as I’ve been trying to do most mornings, but opted for 5:30 instead. As I mentioned, exercise hasn’t been a problem for me lately. In fact, for the first time in a long time I’m sore. 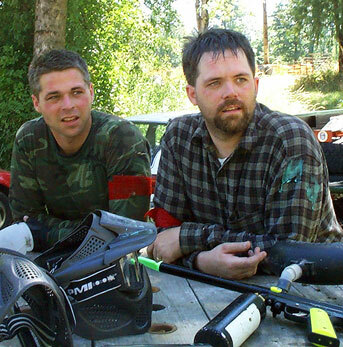 On Saturday, we joined Celeste and Nikki and ten other people in the woods outside Molalla for some paintball action. It’s been five years (!!!) since we last played with Joel and Aimee and Mac and Pam. I’d forgotten how much fun I had last time, and how harrowing the experience can be. It gives me some small understanding of what combat must be like. Though it seems odd even to me, I’m actually fairly aggressive as a paintball player. I know I’d do better working with my teammates, but I usually play the maverick, striking out on my own, boldly stabbing deep into the heart of enemy territory. Sometimes this yields great success — as in the game that I mowed down four of the other team’s six players — but other times I die a foolish death, pinned behind a narrow tree, unable to retreat. Nikki was my nemesis. I took her out in the second game with a nice shot to the gut. In the third game we came to a point-blank face-off draw, John Woo style. In game four, Dan and I teamed up to pin her behind a barrier until he could pick her off. But in every game thereafter, she pegged the hell out of me. I shall have my revenge! Four hours of charging back and forth is plenty of exercise, especially when cloaked in heavy clothes. But what really made me sore was the diving and rolling. My knees are sore, but from scrapes, not from strain. My quads, on the other hand, are sore from strain. To make matters worse, I went biking yesterday. Matt and I took a casual ride from Rosings Park into Portland along the Springwater Trail. We didn’t really push ourselves (it wasn’t the intent), but even so: with quads that already hurt from paintball, the result is a stiff and sore J.D. on Monday morning. Not to mention a J.D. that is so tired that he just wants to crawl back into bed! You’ve been getting 7 hours of sleep when you get up at 4am (and go to bed at 9) — maybe with your increased exercise, you need that extra hour. Another thought is what you are actually eating – exhaustion could be from several things, but are you making really healthy choices when you are eating this new way? Do you get enough iron – which makes red cells and oxygenate your whole body? You’ve been focusing on cutting out sugar – it’s time to reassess if you really do have a nice mix of proteins, healthy carbs, and healthy fats. Once you get good habits down pat, you will simply repeat the healthy habits in a quality way – without thinking about them. Maybe it’s the exhaustion speaking but did you really mean to write, “appreciation” of combat? I’m sure there’s a better word than that. Kind of like anxious and eager (the wif and I debate those two often). Are you having a hard time falling asleep, staying asleep, or is the overall quality of your sleep poor? I ask because I am an expert insomniac and might have some advice for you . . .
My advice get a bottle of Wild turkey that should do the trick LOL!! !